for the World and for Your Future! family, your community and the environment. healthier homes for your customers and protecting the environment. Imagine owning your own business that’s part of the growing $500 billion green movement. A unique business that makes the world better and meets a growing demand for green services. Our eco-friendly cleaning systems answer the demands of homeowners who want cleaner, healthier homes. 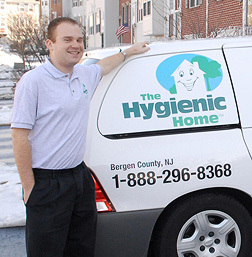 The Hygienic Home uses the latest, state-of-the-art equipment and environmentally safe products, including unique European technologies that clean without leaving harsh irritants or residues that can impact health conditions or enter the ecosystem. Our history shows that once our clients have sampled our services and enjoyed the benefits of a healthier home, many become regular customers. Our closing ratio on customer inquiries is unmatched. The services practically sell themselves. Significant opportunity – every household is a potential client!